Let’s be blunt, Mr President: you lost. 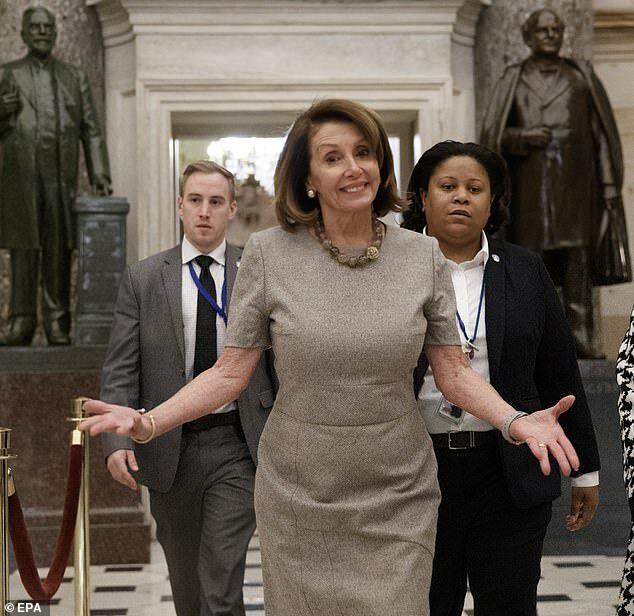 All your indignant huffing and puffing on Twitter can’t change the cold, hard, undeniable fact that House Speaker Nancy Pelosi played you like a chump last week and forced you into a humiliating climb-down over the government shutdown. She kept saying she wasn’t going to give you any money for your Wall, you kept saying you weren’t going to re-open the government unless she did – and she won: you re-opened it with no Wall money. So stop with the phony protestations. When even ferocious media allies like Fox News hosts, the Drudge Report and Breitbart all say you took a drubbing, just admit you took a drubbing. There’s an important reason for doing this: you’ve only lost a battle, not the war. And if you play your next cards right, or should I say ‘better’, you can still end up with a big win – for you, and America. But play them wrong again, and you risk betraying your base, making yourself an impotent slave to the Democrats, and getting an irreparable beating in the forthcoming 2020 election. Make no mistake - this is your defining moment in office since you won the White House. The Wall is your signature policy; it was the central plank of your entire 2016 election campaign, the thing you mentioned most, the thing that resonated strongest with your voters, and the thing, more than any other, that got you elected. You have to deliver on The Wall, or all your bold boasts about being a President who does what he promised will crash and burn. Already, conservative media pundit Ann Coulter, formally one of your biggest supporters, has lacerated you for what she says is a gutless surrender. You’ve proven yourself extraordinarily capable of surviving almost anything thrown at you, Donald, but to be perceived as a weak, broken wimp by your own fans is surely the worst possible slur for a President whose whole image is based around being a strong, tough, unbending leader? However, I don’t think you’re broken. Battered, yes. Bruised, definitely. But not broken. It may well turn out to be the 21 days that define your presidency. Right now, you’re dangling over a cliff, clinging on for dear life, and Ms Pelosi is champing at the bit to trample on your fingers and make you fall into the political abyss. Your poll numbers have taken a massive hit in the past five weeks - as low as 37% - as many more Americans blamed you more than the Democrats for a 35-day shutdown that led to you winning absolutely nothing. Be under no illusion what the real narrative is here: you caved. Indeed, New York magazine revealed reporters have used the word ‘cave’ so often about your actions that Merriam-Webster dictionary reported a 1500% increase in searches for the word! A second lengthy shutdown starting in three weeks would be even more disastrous for you – especially if it ended in more failure. So the big question now is how do you avoid Nancy Pelosi’s high heels slicing into your cliff-dangling hands? You may not want to hear my answer, but it’s the right one. The best leaders understand the power of a carrot and stick strategy when it comes to getting what they want. You, as the whole world knows, want your Wall – about which there is so much hypocrisy. There is already 700 miles of border fencing and security along the southern border, erected in the past 15 years with full support of most of your most vociferous Wall opponents. For all intents and purposes, it’s a wall. You just want to extend it, and make it even more secure. And the money you’ve asked for - $5.7 billion - is a relative pittance. But the political significance of getting the Wall funded is now enormous, and from the moment you lost control of the House in the mid-terms last November, you lost your real power to drive through that funding. Therefore, you have to give the Democrats something they badly want too, or you can kiss goodbye to the most famous and divisive election pledge in history – and quite possibly your chances of re-election too. What the Democrats want in return is permanent legal status for those undocumented immigrants brought to the US as children – known as Dreamers - and an eventual path to citizenship. You know how passionately Pelosi feels about this because she recently spent a staggering eight hours on the floor of the House talking about it. You also know that Pelosi is not as ideologically opposed to the Wall as she now claims to be. So there’s actually a relatively easy deal to be done if you can both park your bitter partisan enmity to one side and put America’s national interest first. It’s not that contentious, even within your own party. Most Americans – 87% in a CBS poll - support the idea of permanent legal status for Dreamers. And most Americans – 76% of voters in a Harvard CAPS-Harris poll, including 63% of Republicans - support the idea of giving the Dreamers a path to full citizenship. In short most Americans have a heart about this issue. They don’t like the idea of illegal immigrants pouring over the border into America, but nor do they like the idea of deporting or stigmatising people who were brought illegally into America as kids through no fault or choice of their own, and have made their homes and lives in the U.S. The vast majority of Americans (82%) also believe immigration has generally been a good and not bad thing for America. I believe that in YOUR heart, Mr President, you agree with most Americans. I don’t believe you have any beef with legal immigrants – you’re married to one! - or with those who were brought illegally to the U.S. as children. I believe your beef is with those who still seek to enter America illegally, some of whom want to cause terrible harm to the country with drugs, terrorism or gang violence. When you enforced a brutal child separation policy on the border last year, it was the lowest moment of your tenure. Now you have a chance to repair some of the damage of that heartless fiasco and do the right thing with a move that could be the highest moment of your tenure. You can do a deal that protects those undocumented immigrants already in the US who deserve protection, and that helps those Dreamers become fully-fledged Americans. And at the same time, a deal that protects all Americans, with enhanced security across a border that is still being illegally crossed way too often for nefarious reasons. Ali didn’t just win in the ring, but in people’s hearts and minds too. This is your chance to go from chump to champion. Save the Dreamers in exchange for The Wall.